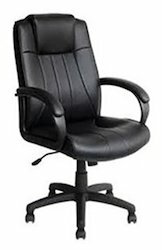 Minimal Mantenance, less maintenance for chair, and little need to clean. · Durability, design won't occur problem as upholstery chairs, such as receive tears, padding flatten that make chair worn-looking and uncomfortable. · Style, modern look with varity of mesh color, employees appeal to choose a modern-feeling seat to decorate their office environment. 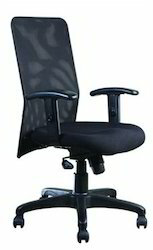 · Support, ergonomically shaped, mesh back curved, creates a good posture. The adjustability also helps employees that diffrent size can supported perfectly..
Our company has gained name and fame for offering Rolling Chair to the clients. Medium back revolving chair with tilting hydraulic height adjustment, height adjustment arm rest and Synchro tilting with nylon base and high quality fabric with high density foam and rest will be netted cloth. High density foam with high quality fabric with nylon base.